Making Envelopes Is A Snap! Making envelopes ! You are wondering. Why make them when you can easily buy them? There will come a time when you just need to make your own. Maybe, you made a card that's just can't fit into any of those standard size store bought envelopes. Or maybe, you are just being adventurous and want to try something new. Whatever it is, making envelope is simple and fun. The above is a decorated envelope. You can also use magazine pages or wrapping paper to create these envelopes. Just print the recipient address on a white sheet of paper and paste on the address area for easy reading. Tips: Envelopes that are not according to the standard sizes need more postage. Do check with your local Postal Office before posting. 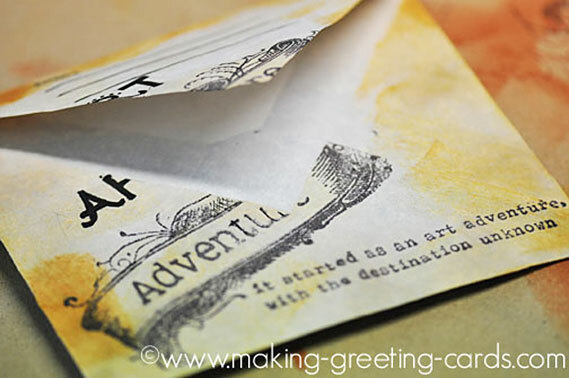 Place your handmade card on a piece of cardstock a little bigger than your card. Mark on the cardstock the shape of your card. Now, add half inch to the left and top and cut it out. This is now your template. Place template on the middle of the paper or the back of your wrapping paper and draw lightly with a pencil around it . Now you got the shape of the envelope on the paper. On the paper, extend the four sides. Refer to the diagram on the right. On side "C" extend by about half inch. Side "D" about an inch. Side "A" and "B", extend half inch plus half the width of your template. Cut the 4 corners just as on right diagram shown here. Fold side "A" to the centre. Apply glue to side "B" and paste onto side "A". Apply glue to side C and adhere it to "A" and "B". Trim flap "D" as shown with a corner rounder or deckle scissors. Voila! You have your own unique envelope.